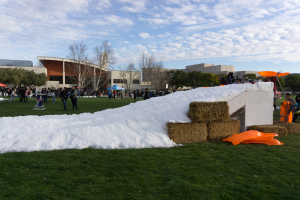 The campus got a bit colder last week during the annual Winter Snow Day, presented by ASI and the Recreation and Wellness Center (Rec Center). Snow was spread out in front of Pfau library for visitors to play with along with sledding and snowboarding. Many vendors were in attendance during the event such as Carl’s Jr., Mountain High and Active Rideshop, who were giving away prizes for hitting cutouts of celebrities with snowballs. Medical student Diana Aguas heard about the event this morning and brought her son out to the Snow Day. “This is really cool that they put all this snow out here for people to play on. My son is having a lot of fun,” said Aguas. The event was open to the public and encouraged parents to bring their families out to come enjoy the snow day filled with music, food and prizes. The event was a great way for everyone to forget about the bad weather that we experienced and to have some fun while the sun was out. Snowball fights, snowmen builds and event a few falls from guests were all welcomed during this year’s Snow Day. “I love the snow so this was really fun that the school would put this together. I fell a few times but hey, the snow was there to catch me,” said freshmen Cassandra Vargas. “I really liked the environment but it’s getting a lot colder out here now that the sun just went down,” said Biology major Justin Castro. “It might be time to head home before I end up getting sick,” continued Castro.